President-Prime Minister Relations Strained as Maithripala Wants Ranil to Step Down as PM Before Testifying At Treasury Bonds Presidential Inquiry Commission On November 20th. The prevailing political relationship between President Maithripala Sirisena and Prime Minister Ranil Wickremesinghe has come under heavy strain lately due to the on going Presidential commission of Inquiry into the alleged Treasury Bonds Scam , it is learnt. According to informed sources close to the Coalition Government headed by President Sirisena and Premier Wickremesinghe , the bone of contention in the current crisis is a “strong request amounting to a demand”made by Maithripala that Ranil should “voluntarily” step down as Prime Minister before testifying before the Presidential Commission of Inquiry investigating the Issuance of Treasury Bonds by the Central Bank of Sri Lanka. Prime Minister Wickremesinghe who has already submitted replies in the form of an affidavit to a questionnaire sent by the Presidential commission of inquiry is scheduled to testify before the Inquiry commission on November 20th 2017 and provide further clarifications to the Commission. It is understood that the Prime minister would respond to queries by the Commission Chairman Justice K.T. Chitrasiri and Commissioner Justice Prasanna Jayawardane only and would not be questioned by counsel from the Attorney -Generals Department. The Commission of Inquiry is scheduled to wind up on December 8th 2017. The latest problem that has arisen is the demand couched as a request to the prime minister who is also the leader of the United National Party(UNP) leader from the president who is also the leader of the Sri Lanka Freedom Party(SLFP)that the PM should step down before appearing before the Inquiry commission. The request was conveyed on behalf of the President to the Prime Minister earlier this week said informed sources. Mr.Wickremesinghe who left for Singapore on Nov 9th night will be away from Sri Lanka for four days. 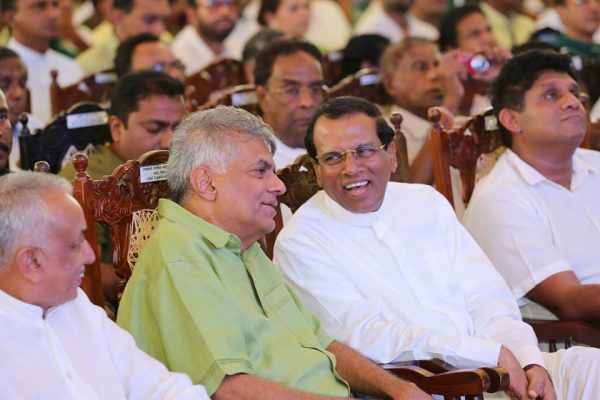 Apparently the president is of the opinion that it would be a terrific boost for the personal image of Ranil Wickremesinghe as well as the public image of the UNP- SLFP Coalition Govt if the premier would vuluntarily step down as PM before testifying. While the President is firmly convinced of the bona fides of his Prime Minister in this issue, he is somewhat worried that political adversaries would exploit this matter and tarnish the “incorruptibly clean” image of the premier. 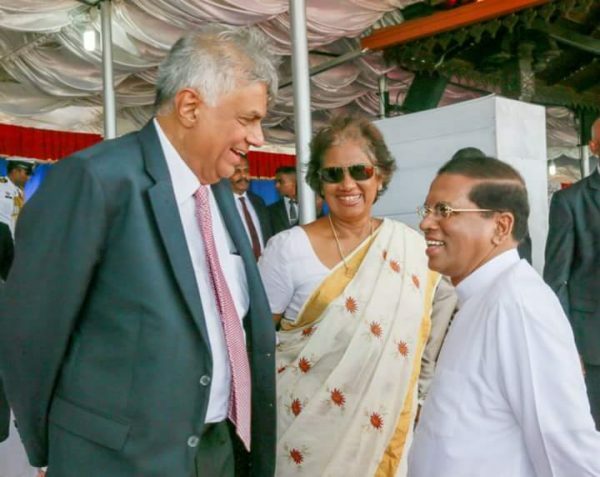 As such Maithripala feels that Ranil should set a bold precedent by stepping down and appear before the commission of inquiry as an “ordinary citizen”. The president thinks this would elevate the Prime minister to a higher moral ground, refurbish his public image and silence the opposition. Wickremesinghe could revert back as Prime minister in due course. According to informed sources President Sirisena thinks the speaker Karu Jayasuriya or Finance minister Mangala Samaraweera could serve as a Caretaker Premier briefly during this period. This request however has been outrightly rejected by the Prime Minister who feels there is no necessity for such a controversial move at all say UNP circles.. Mr. Wickremesinghe has on his own volunteered to participate in the commission proceedings in the interests of truth and justice. He has answered a questionnaire already and is now ready to offer further clarifications by testifying before the commission. The Prime minister is not involved in any way with the alleged Treasury Bonds issuance fraud and is definitely not implicated. As such there is no need for Ranil to “grandstand” by stepping down first and then testifying. Irate UNP sources state that the very act of stepping down would be politically counter productive as the opposition would portray the move as proof of guilt. “Why should Ranil do that” asked a UNP stalwart. “Would it not convey a wrong impression that the PM is in some way “guilty” in this matter” he queried. He further posed the question.” Is this some mad stunt by Maithri to oust Ranil as PM”? Political observers opine that the proposed move would throw the Coalition Govt into disarray at this point of time. Even though President Sirisena may have very genuine motives in making such a controversial “request’ the move could result in unintended consequences. Besides such an exercise though temporary could have drastic unforeseen consequences.It is very possible that the President is acting sincerely but is being given wrong advice by vested interests allege UNP sources. The fragile political equation between Maithripala Sirisena and Ranil Wickremesinghe has suffered many storms in the past. Most of them have been virtual “tea cup tempests” and the coalition Govt despite pressures has withstood the test of time. Most of the earlier Maithri- Ranil disputes however concerned external personalities such as the former Central Bank Governor Arjuna Mahendran or Ex- Finance Minister Ravi Karunanayake. This time there is a crucial difference as the issue concerns Premier Wickremesinghe himself personally. It is learnt that there has been little communication between Sirisena and Wickremesinghe for some days now. As news of the Maithripala – Ranil estrangement trickled down to other constituents of the coalition Govt there was much anxiety. Up Country Tamil and Muslim party leaders in particular are extremely perturbed and concerned over this issue.Some of them are currently engaged in bringing about rapprochement between Maithri and Ranil on this issue. Meanwhile concerned UNP and SLFP circles are communicating with former President Chandrika Bandaranaike Kumaratuga who is currently in the USA about this crisis. It is expected that Chandrika would return home shortly and bring about a mutually acceptable settlement of the issue. Despite the current tensions, saner counsel is expected to prevail and the “friction” downplayed by both parties as an exchange of different opinions over a sensitively prickly issue. Both the UNP and SLFP as well as the respective leaders realise that unity is essential for the coalition Govt at this particular juncture. « Disclosure of Telephone Calls Between Arjun Aloysius Before Presidential Inquiry Commission: With Ravi Karunanayake-84;Sujeewa Senasinghe-62; Mela Karunanayake -320;Harshana Rajakaruna -23;Hector Appuhamy -23.